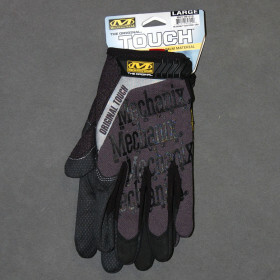 Touch Gloves » Protective Solutions, Inc. The MechanixWear Original® Touch® glove allows you to manage your touch screen devices without removing your gloves and compromising safety. Highly conductive AX™ Connect mimics the human touch for easy navigation of all your touchscreen devices. Equipped with three-finger conductivity and four designated contact points. - Form-fitting TrekDry® helps keep hands dry and comfortable. - AX™ Connect touchscreen compatible material. - Thermal Plastic Rubber (TPR) hook and loop closure provides a secure fit.